Washing your car regularly is one of the easiest and most cost-effective ways to keep your car in tip-top condition. If left unwashed, road salt, dirt, and debris will collect on your car’s body and do severe damage to it. That’s why it’s crucial that you know how to wash your car yourself. Sure, you can always visit a touchless car wash and relax in your car while machines do the work for you. However, those commercial car washes often use abrasive materials that can scratch at your car’s paint job. They’re also more expensive to use in the long run. So, to give your car the care it deserves, and to save yourself some money, take the time to learn how to wash your car at home. Fortunately, washing your car is easy, and should only take an hour or two to do. Here’s how to wash your car like a pro. It’s never wise to park your car in direct sunlight when you’re washing it. The heat will make the soap and water you’re using dry too quickly, which will leave water marks and soap and scum deposits on your car. Instead of a nice clean car, you’ll end up with a splotchy paint job. Find a spot with some shade before you get started. And don’t wash your car immediately after driving it – it’ll be hot then too. Remember not to use household cleaning products. Cleaning agents like hand soap, dish-washing detergent, and glass cleaner weren’t formulated to be used on cars. If used, they could strip the car of its protective wax. Instead, use car-specific wash products – they’re milder and specially designed for automotive paint. Also, remember to follow the product’s instructions. The methods of application and the amounts used of various products can vary from brand to brand and vehicle to vehicle. So, whenever the cleaning products come out, so too should your reading glasses. Take two of the buckets from your pile of gear, then fill them with water. Next, add the prescribed amount of car wash soap to each bucket. You now have your washing buckets ready. The second wash bucket is for your wheel wells. It’s recommended that you keep the water for your wheel wells and the water for your car’s body separate. Your wheel wells typically have more dirt and grime on them. You don’t want to rub that dirt and grime over your car’s body. If you do, you risk scratching your car. Fill a third bucket with plain water. This will be the water you use for rinsing. Next, hose your car down thoroughly to break down any excess dirt or debris. Never use a strong jet of water, as this can rub grit over the paint and scratch it. Also, aim the water downwards, especially around windows. If you aim upwards around your windows, water can seep through the rubber seals and drip into your car. 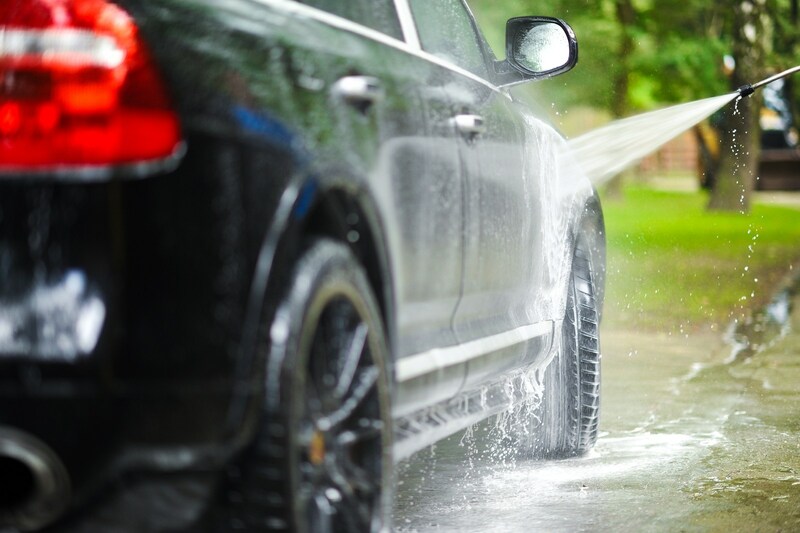 Remember to continuously hose down your vehicle as you wash it to keep water droplets from drying and leaving water spots. The next thing to do is wash the wheels with a scrubbing brush. The wheels are likely the dirtiest part of your car, so it’s important to get them first. That way, any dirt that’s sprayed up from the wheels onto the body can be washed off later. Be careful not to scrub too hard – you wouldn’t want to scratch something. If your wheels are already looking clean, you could just use a sponge instead. The most important thing to remember here is to use a product specifically formulated for your type of wheel. Consult your owner’s manual and find out what kind of wheels you have, then choose the appropriate cleaning product. When in doubt, just go with the least powerful product available. Take out your large wash mitt (or sponge), soak it in soapy water, then begin applying it to your car. Avoid moving the sponge in circles, as this can result in small scratches called swirl marks. What you should do is move the wash mitt lengthwise across the body of your car. Also, don’t forget to rinse out the wash mitt often to get rid of any excess dirt particles it picked up. If you don’t, the dirt and grime you drag across the body of your car will scratch the paint. When the water becomes too dirty, empty the bucket out and re-fill it with fresh water. Don’t forget to hose every portion of your car down continuously as you clean it. Keeping it wet will prevent water droplets from drying in the sun and becoming water spots. Once you’ve finished cleaning your car’s body and wheels, you can spray the bottom of your car with your hose. This is an important step, since your undercarriage comes in contact with damaging road salt and is susceptible to rust. For our complete guide to protecting the bottom of your car from rust damage, click here. Finally, once you’ve washed every portion of your car and hosed down its undercarriage, you can begin the drying process. Don’t let your car air dry or try to dry it off with a drive around the block. This will only leave water marks on your freshly cleaned ride. Instead, find a few fresh towels to get the job done. Microfiber towels work best. Wipe down every surface you washed. Don’t be shy about using several towels to get it fully dry. Never skip this step. You don’t want to go through the hassle of cleaning your car only to have your work wasted by water spots. Once your car is dry, you can apply wax. Was is like sunscreen for your car. It acts as a layer of protection for your paint against the sun to keep it from fading or deteriorating. Also, it’ll protect the finish from any dirt, dust, or sand kicked up by cars driving in front of you. To wax your car effectively, place a toonie-sized amount of wax on a damp sponge. After that, apply it to your car using gentle, circular motions. Only cover a small section of the car at a time, and apply more wax as needed. Let the wax sit for a few minutes. You’ll know it’s ready to come off if you can swipe it with your finger without making it smear. Once ready, you can use a microfiber cloth to remove the wax. Again, you’ll want to use small, circular motions. Waxing is important. It will give your car a smooth finish, and will help prevent future scratches, chips, and fading caused by the sun. Finally, to wash your car like a pro, apply water repellent treatment to the windows. Get yourself some Rain-X (or a similar product) and another microfiber cloth. Next, apply the water repellent to your windshield and windows in a circular motion. Products like Rain-X improve your visibility when it rains by causing water to bead and slide off your windshield and windows. No matter how many times you wash your car, there’s nothing quite like the cleanliness of a new car. Instead of trying to chase down that new-car feeling by washing your old car every week, you could just get a new one. That is, of course, if your budget and lifestyle allow for it. Visit us online by clicking here, or call or text us at 780-777-7777 – our automotive experts are dedicated to helping you find a car that works best for you.